Love a book? Hate a book? Share your opinion while you network with other YPs then head downtown for First Friday. 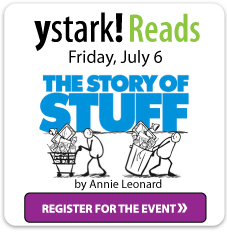 This month we are continuing our discussion of The Story of Stuff : How Our Obsession with Stuff Is Trashing the Planet, OurCommunities, and Our Health and a Vision for Change by Annie Leonard. Leonard’s message is startlingly clear: we have too much Stuff, and too much of it is toxic. Outlining the five stages of our consumption-driven economy—from extraction through production, distribution, consumption, and disposal—she vividly illuminates its frightening repercussions... With staggering revelations about the economy, the environment, and cultures around the world, alongside stories from her own life and work, Leonard demonstrates that the drive for a "growth at all costs" economy fuels a cycle of production, consumption, and disposal that is killing us.